Hayes’ Hadlee Bruns, right, lofts a shot over Dublin Jerome’s Kendall Poach, middle, and Lauren Gilbert during the first set of Thursday’s OCC showdown in Delaware. It’s a good news, bad news situation for the Delaware Hayes girls volleyball team. The bad news is that the Pacers lost their third straight game: 25-22, 25-22, 25-23 to Dublin Jerome Thursday night in Delaware. They fell two games back in the OCC-Cardinal race. The good news is that Hayes has played right with league leaders Jerome, Dublin Scioto and Worthington Kilbourne … and isn’t out of the title picture yet. That’s really good news because the Pacers don’t appear to be quitting any time soon. If there was ever a time to quit, it would have been down 22-14 in the third already down two sets. Hayes used a 9-1 rally to pull even before it ran out of gas, falling on back-to-back kills by Katie McKibbon and Jaci Carpenter. Carpenter, a sophomore, came up big with a pair for the Celtics in the second set as they scored eight of the final 11 points to rally from behind. Jerome used a 9-3 rally to take control in the first set, led by Kendall Poach with a pair of kills in that stretch. Carpenter led with 12 kills and four aces, Poach added nine with four blocks, Shefali Sriniavasan had four aces and Lauren Gilbert added three to lead the Celtics (8-1, 5-1). 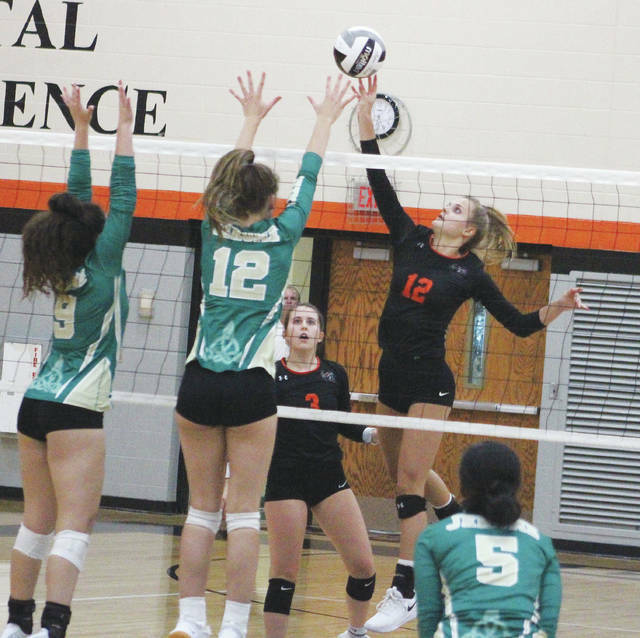 Sydney Krewson had 10 kills and 13 digs, Mia Thompson had a team-high 20 digs, Kaiden Murphy led with four blocks, Becca Rocassin led with 18 assists to go with seven kills and Anna Johnson added 14 assists and seven kills for the Pacers (6-5, 3-3). Next up, Hayes hosts Marion Harding in non-league play Saturday at 11:45 a.m.